1).Graphical programming interface - Support the drag-and-drop graphical programming software,just plug and play,get what you see,easy for the Arduino robot learners. 2).Designed with 4-DOF robot arm and 2-DOF robot pan-tilt platform,enjoy much of the freedom of the control angle. 3).5DBi External WiFi Antenna gain high signal intensity and long transmission distance,more fast and steady,brings you real time. 4).Multi Speed Control System for you to control the speed of the robot. 5).Built-in 2200mAh battery pack with 12V/8A protection circuit,provide continuous power for robot for a longer endurance. 6).Adopt high quality 12V 350rev/min powerful motor,the maximum load is up to 8 Kg,which support continuous power for robot. 7).Power system:Double dc gear motors, planetary gear box,12W,1.5W,Degree of climbing:30°. Module factory has built in a good program,you need to assemble together,then start playing! Multi-function - Wireless WiFi control,video transmission,video Record,take photo function with 4 automatic freedom manipulator. Real-time image transmission - Adjustable Hd camera two degree of freedom steering cloud terrace with a USB Wi-Fi adapter so you can check the video in a real-time manner on your PC or any smart phone.Dynamic video resolution can be up to 640*480p,Frame up 30F/s. The top Robot Platform - 2.1KG Big tank robot chassis,full stainless steel car body,laser-carving and welding body,military crawler-type car Robot. Remote Control by APP - Automatically self-built signal hot point after power on,and support computer web browsers,smart phone and tablets APP(iOS/Android),PC to control the robot car. 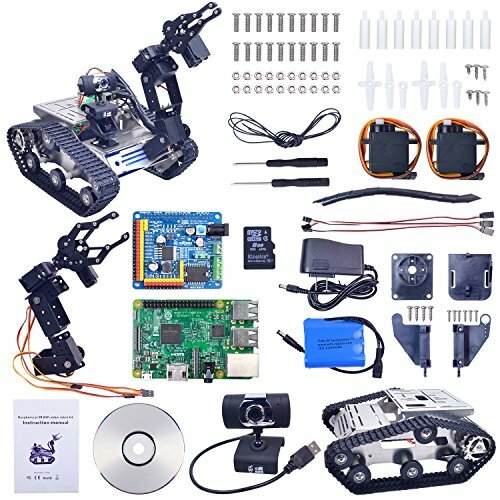 Refined tutorial - An elaborately-written user manual instructions of how to assemble the robot car.Provided with the complete source code and detailed video tutorials.you can change the code by yourself to explore greater fields. If you have any questions about this product by XiaoR Geek, contact us by completing and submitting the form below. If you are looking for a specif part number, please include it with your message.